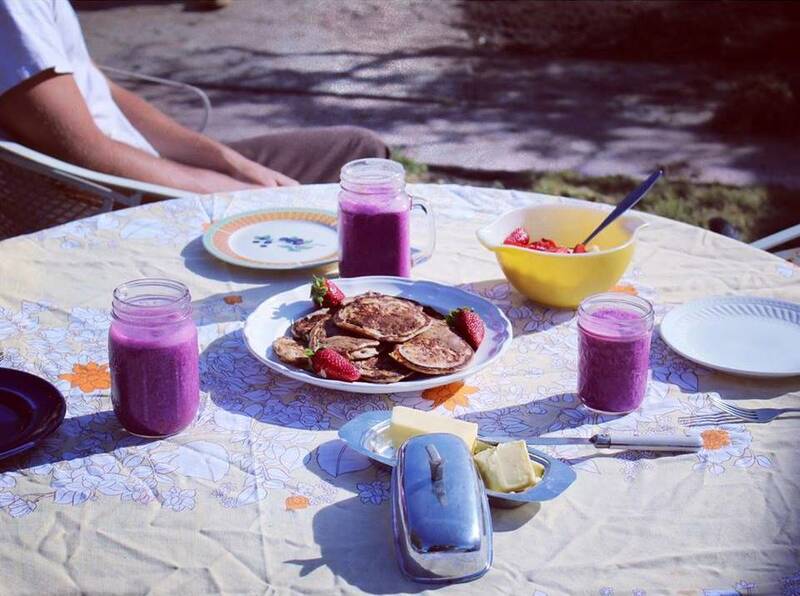 Interested in learning techniques for creating a delicious breakfast? Chef Madia Jamgochian is teaching “Intro to Cooking-Breakfast!” at New Leaf Community Markets in Westside Santa Cruz. 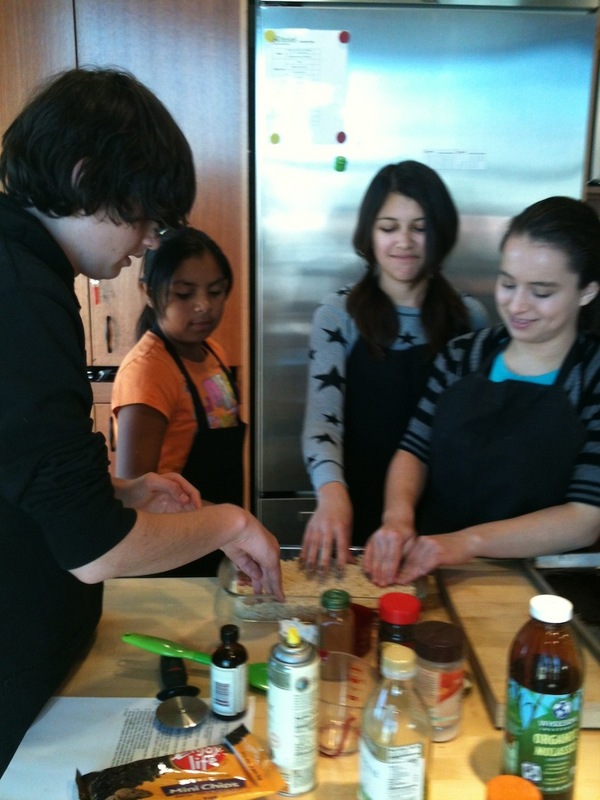 The class is from 5 -7:30 p.m. Friday, April 24, and the cost is $40 per person or $70 for 2. Preregistration is required and space is limited; contact New Leaf at 426-1306 or visit newleaf.com/events. Learn about all of New Leaf’s upcoming classes and activities, including “Go Foods for Fitness” on Earth Day, April 22 (taught by Sandi Rechenmacher), at newleaf.com/events. One way to celebrate National Peanut Month during March: bake up a treat that includes peanut butter! Of course, there are lots and lots of recipes out there. There are some on the National Peanut Board web site, including a link to a fancy dessert recipe via Bon Appetit: peanut dacquoise with peanut butter mousse. With elements like meringue, be prepared to spend some time and effort. For those who want a fast, easy recipe, here is a quick one that calls for only five ingredients. This dish is from the Pillsbury web site. Some of the bakers who tried the recipe shared comments. These include the fact it makes a good after-school snack, it’s easy to do variations, and it also works for any “Elvis-themed” parties since the famous singer reportedly loved peanut butter and banana sandwiches. 1. Separate or cut dough into 4 long rectangles (if using crescent rolls, press perforations to seal). Cut each rectangle in half; press into 3 1/2-inch squares. 2. Spoon peanut butter in center of each square; top with 2-3 banana slices. Fold dough over filling; press edges with fork to seal. Brush with egg; sprinkle with sunflower nuts. 3. Bake at 375°F 12 to 16 minutes. Whole Foods Market has started carrying a new fish called paiche, which is a whitefish from the Amazon. After trying a complimentary sample, I wanted to pass along some information about paiche (pronounced “pie-chay”). I also have a recipe to share plus an opportunity for one of you to win a Whole Foods Market gift card (see end of article for contest details). And in case you were wondering, it’s not merely Valentine’s season: February is National Heart Month, so it’s good to think about eating heart-healthy foods like fish! As stated in a December 2013 New York Times “Front Burner” article, paiche is a freshwater fish with a “mild, sweet flavor and a meaty, dense texture that is suitable for sautéing, roasting and grilling; it also holds up well in stews.” The article warns that although the fish is threatened by overfishing and deforestation, it’s being sustainably raised in ponds in Peru monitored by the Convention on International Trade in Endangered Species. It is being filleted, shipped frozen from Peru, and thawed at Whole Foods Market. WFM is the only national retailer that’s currently carrying paiche, and it’s priced at $14.99/lb. This paiche is raised without antibiotics, pesticides or added hormones. It has an optimal ratio of omega-3 and omega-6 fatty acids, plus 20 grams of protein in every 3.5-ounce serving. It has a lower fat content than some similar whitefish like Chilean seabass—as I soon discovered, the decreased fat correlates to decreased flavor. I got my paiche at the market with complimentary seasoning added to my filet (whenever you buy seafood at WFM, you can ask for seasoning at no extra cost). I chose a lemon-herb combination; in the future I would try something with more kick like a Cajun seasoning blend—that was available at the market too—or fresh garlic and other strong herbs. The fish was subtly flavored after my husband grilled it; it’s one of those products that takes on the flavor of what you add to it. The texture was pleasing, very steak-like. A bonus of the mild flavor? My 2 ½ year old daughter loved it! It actually made her open to trying seafood in general whereas she had previously been a bit hesitant; last night she was willing to taste freshly grilled salmon and asked for more. Another advantage to a mild-tasting fish is that you can use it as a conduit for a sauce or ingredient that you want to be the star of your dish. 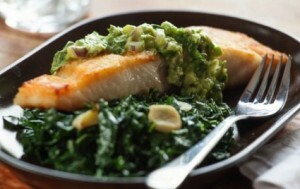 I bet the paiche is perfect for this Pan-Seared Paiche with Spicy Avocado Sauce and Greens recipe provided by WFM, which includes jalapeno (see photo). Want the chance to win a gift card so you can buy paiche and/or other ingredients at WFM? Keep reading! Prize: A $50 gift card to Whole Foods Market. To enter, email your name to tfatemiwalker@yahoo.com and include the words “Whole Foods seafood.” Deadline to enter is Fri. Feb. 14, 2014 at 9 p.m. This contest is open to readers of Tara Fatemi Walker’s Examiner.com and Santacruzfoodie.com sites. Employees of Examiner.com are not eligible for this promotion. 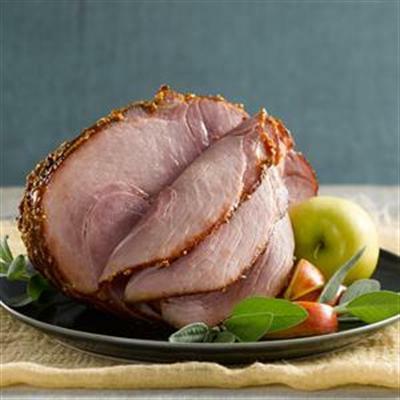 Whole Foods Market in Northern California, including stores in Santa Cruz and Capitola, has lots of tasty offerings for the 2013 holiday season including Dungeness crab and Wellshire Spiral Sliced Hams. I’ve had the great fortune to eat both in the last couple weeks, and highly recommend them. More details are below. Also, Whole Foods Market (WFM) in Capitola is offering holiday tastings on Saturday, Dec. 21 from 12 -2 p.m. Each department will be handing out samples of at least one product; rumor has it that the crab and/or ham will be available to taste! The Dungeness crab at WFM Capitola is delivered fresh from San Francisco fisherman six days a week, specifically from Pezzolo’s Seafood at Pier 45. You can taste the freshness, and the WFM Seafood Department staff members do a fantastic job of cracking and cleaning your whole, cooked crabs (free if you ask). The crab is really meaty and delicious; my family ate ours cold and dipped various bites into lemon, butter, or both. Some nice seeded baguettes and a side dish of brussels sprouts were the perfect accompaniment; of course, some people will choose to heat their crab and everyone has their own preferences for what to eat with crab! Bon Appetit. Bonus: if you buy 3 crabs or more, you get $1.00/off per pound (the initial cost varies depending on market price that day). Santa Cruz chef Lauren Hoover-West has graciously shared her recipe for Coffee Toffee, a yummy dairy-free treat for Halloween or any occasion. According to the chef, half of America can’t eat dairy, and of course those folks need recipes too! California Culinary Academy graduate Hoover-West, author of the cookbook “No Wheat No Dairy No Problem,” regularly teaches classes at New Leaf Community Markets’ Westside location. Her November classes are Allergy-Friendly Holiday Cooking (Nov. 14, includes turkey and many sides), Holiday Pies: No Wheat, No Dairy, No Problem!, (Nov. 20, includes Apple Pie, Citrus Curd Tart and Sweet Potato Pecan Pie), and Raw Vegan Holiday Desserts (Nov. 22, includes Cheesecake and Raw Pumpkin Pie). Each class costs $40 and is from 6-8:30 p.m. Pre-registration is required. See complete New Leaf Westside November schedule. Read more about Lauren at her web site. Grease a cookie sheet (approx. 9×13 inches) and set aside. 1. In a medium heavy-bottomed pot stir together, with a silicone spatula or wooden spoon, all ingredients except for the chocolate. 2. Cook the mixture over medium-low heat, constantly stirring with a wooden spoon until it reaches 315 degrees. You will need a candy thermometer. Quickly remove from heat. 3. Pour mixture into the cookie sheet and spread with a silicone spatula to smooth out into a rectangle that is about 1/8 inch thick. 4. Cool 20-30 minutes on the kitchen counter. 5. While cooling the Toffee, melt the chocolate in a double boiler or in a glass bowl over simmering water. Cool the chocolate for 5 minutes off the heat. 6. Pour melted chocolate over the Toffee and spread evenly to cover the Toffee. 7. Let the chocolate set/harden at room temperature for about 4 hours. You can put it into the refrigerator to speed up the process, but it may be dull or bloom (turns white). 8. Break into pieces and enjoy! Store in an airtight container at room temperature. 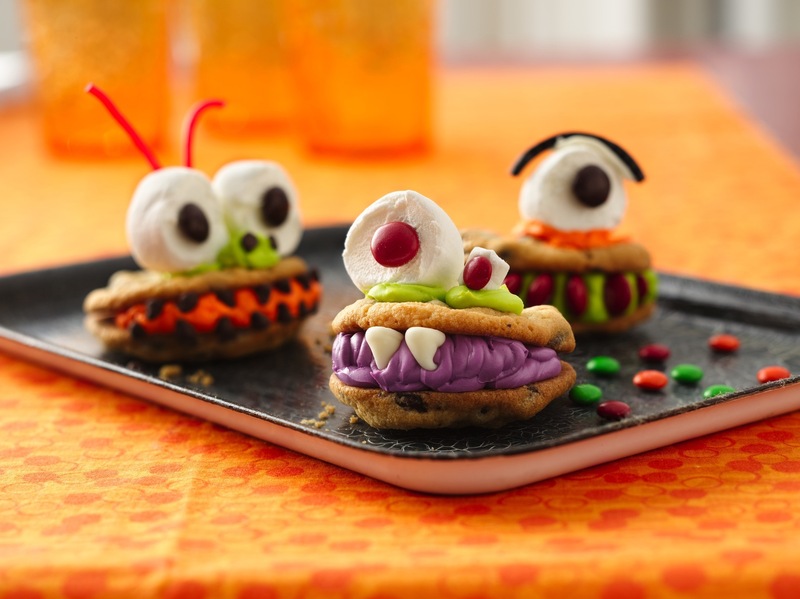 Looking for easy Halloween recipes? 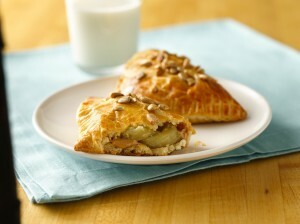 Here are two provided by Pillsbury, with a link to one additional recipe. I’ll publish at least one more—including a dairy-free treat from a local Santa Cruz chef—in the next few days. Heat oven to 350°F. On ungreased cookie sheet, place cookie dough rounds 2 inches apart. Bake 12 to 16 minutes or until edges are light golden brown. Cool 2 minutes; remove from cookie sheet to cooling rack. Cool completely, about 10 minutes. Meanwhile, in medium microwavable bowl, microwave 1 cup of the white vanilla baking chips uncovered on High 45 seconds. Stir; if necessary, microwave in 15-second increments, stirring after each, until chips can be stirred smooth. Cool 5 minutes. Stir in frosting until well blended. Reserve 2 tablespoons of the frosting mixture to attach decorations. Use gel food colors to tint remaining frosting in desired colors. Spoon each color of frosting into resealable food-storage plastic bag. Cut 1/2 inch off one corner of bag, and pipe on bottom of 1 cookie. Press another cookie, flat side down, on frosting at an angle, cookies touching on one side and about 1 inch apart on the other, to look like open mouth. To decorate, press remaining white vanilla baking chips in frosting for teeth. Use reserved frosting mixture to attach eyes, using decorations as desired. Heat oven to 350°F. Line 12-inch pizza pan with foil; grease foil with shortening. Cut cookie dough into 1/4-inch slices; arrange evenly in pan. With floured fingers, press slices to form crust. Bake 16 to 20 minutes or until deep golden brown. Cool completely, about 30 minutes. In small bowl, beat cream cheese, sugar and vanilla with electric mixer on medium speed until fluffy. Use foil to lift crust from pan. Carefully remove foil from crust; place crust on serving platter or tray. Spread cream cheese mixture over crust. In a small resealable food-storage plastic bag, place chocolate chips and oil; seal bag. Place bag in bowl of very hot water. Knead bag several times to melt chips. Cut small hole in 1 corner of bag. Working from center to outer edge, pipe chocolate to form spiral design over top of cream cheese mixture. Working from center of spiral to outer edge, draw tip of knife lightly through spiral to form web design. Refrigerate until chilled, at least 1 hour. To serve, cut into wedges or squares. Cover and refrigerate any remaining pizza. Another Halloween recipe from Pillsbury is for Crescent Mummy Dogs. Looking for some fun recipes to liven up your tailgating parties during football season? Here are a few recipes that will kickstart the game AND your taste buds. I want to thank the folks at Onion Crunch for the ideas. If you’re unfamiliar with Onion Crunch, it’s a crispy, onion-topping condiment – made with real onions – that comes in several flavors including traditional, bacon, and chipotle. Sweet & Sour Chicken Wings: Ditch the regular hot Buffalo wings for a tastier version of a classic tailgating dish. Combine Sriracha hot sauce with honey and orange juice to give your wings a sweet citrus flavor that still packs some heat. Cheese-Stuffed Meatball Sliders: Master the grill, spice up your tired hamburger sliders with some modern cheesy deliciousness. Get the same classic look of burger sliders but with a twist. Try adding bacon, pancetta or Chipotle-flavored Onion Crunch for added flavor. Grilled Roasted Corn: When it comes to corn on the cob toppings, don’t be afraid to shy away from classic butter. Mix it up with fresh chives, mayonnaise, Cotija cheese, chile powder, or lime and you’ll be the tailgating champion. Hot Guacamole: Trade the traditional guacamole recipe for a spicy one on game-day. Try adding jalapenos, cumin, and onions for a zesty dip nobody will be able to resist. 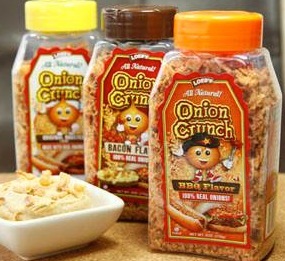 See more recipes featuring Onion Crunch. California Strawberries web site is one resource for tips and recipes including one lunchbox item called “Berry Good Wraps.” Strawberries are recommended by many health professionals as part of a healthy diet. Interesting fact: More than 1.7 billion pounds of strawberries are annually harvested by nearly 400 family farmers in California. This includes 793 million pounds between April-November in the Watsonville and Salinas areas. Almost every strawberry that is eaten in the United States is hand-picked by someone in California. One recipe that the California Strawberries site features is “Grilled Salmon with Strawberry Ginger Salsa,” which can be a satisfying weekday family dinner. Also, as the recipe mentions, you can substitute another fish filet of your choice, whether it’s something that your kids enjoy more than salmon or something that goes on sale at your local market. Bon Appetit! Prepare at least one hour ahead. Mix cucumbers, green onion, cilantro, yellow pepper and vinegar. Cover and chill at least one hour. Just before serving, add strawberries. In a small saucepan melt butter with garlic over low heat. Stir in honey, soy sauce and lemon juice and cook 2 minutes, set aside. Prepare a charcoal grill, when ready brush sauce on salmon pieces and place on a well-oiled fish grilling rack. Place rack over coals about 4 inches from fire and grill approximately 4 to 5 minutes on each side. Brush with the sauce again after turning, and again when done. Transfer to warm platter and top with salsa. 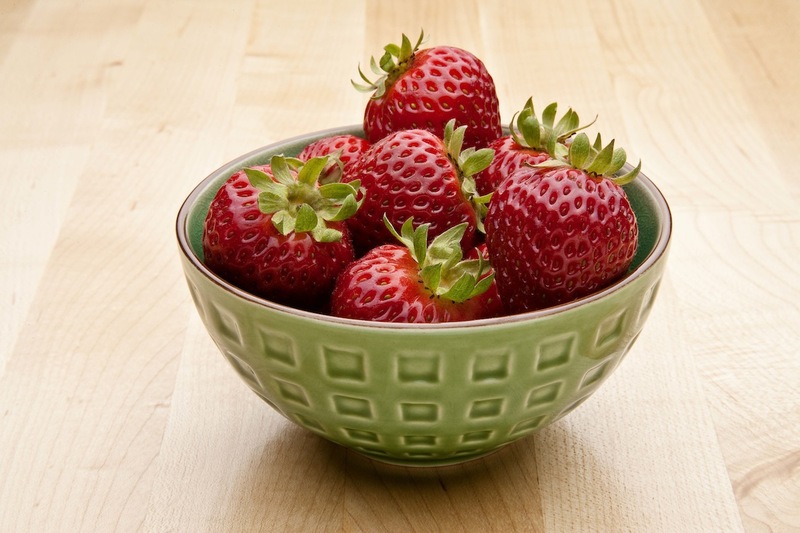 Start of the school year means parents need healthy recipes: how about strawberries? Hard to believe, but it’s already the time when many kids are returning to school, which means lots of parents are thinking about how to incorporate healthy recipes into a packed schedule. Fresh vegetables and fruits can help with this strategy, and the California Strawberries web site has tips and recipes including “Skinny Strawberry Sandwich” (see below) which the California Strawberry Commission recommends as an after-school snack. Registered dietitian and acclaimed author David Grotto (101 Foods That Could Save Your Life) includes strawberries on his list of recommended foods to help maintain a healthy daily diet. Locally grown California strawberries are packed with beneficial antioxidants and nutrients including potassium and fiber. In fact, a serving of just eight strawberries contain more vitamin C than an orange! I’ll post one more article in the next few days that will contain another strawberry-related recipe, and some back-to-school ideas and tidbits on this sweet and popular fruit. In food processor, process cheese, honey and zest until well mixed, or mix in bowl with wooden spoon. 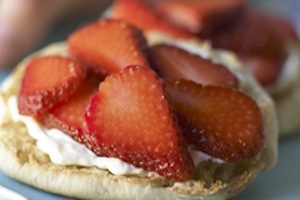 Spread 1 tablespoon cheese mixture on cut side of 1 muffin half; top with 1/4 cup strawberries. Repeat with remaining ingredients to make 8 open-faced sandwiches. Makes 4 servings. Tip: Make cheese mixture ahead and store in refrigerator. At the strawberry festival on Saturday June 1, which benefits the Walnut Avenue Women’s Center, you can win dinner for 2 at 12 Santa Cruz restaurants. That’s the delicious Grand Prize of the event’s raffle. This is the 25th annual festival for WAWC (Walnut Avenue Women’s Center), which has worked to improve the quality of life for women, children, and families for more than 75 years. Read more at the WAWC web site. The Strawberry Festival raises funds for youth development services including mentoring, teen pregnancy prevention, teen dating violence awareness, educactional workshops, and support groups. Strawberry Festival 2013 will be held at 303 Walnut Avenue in Santa Cruz from 11 a.m.–4 p.m. Admission is free, and there will be food available for purchases including barbecue lunch plus strawberry shortcake, chocolate-dipped strawberries, strawberry lemonade and fresh strawberries. There will also be carnival games, a bounce house and dunk tank, live music, and a plant sale. For more information on the festival, call (831) 426-3062. The festival comes right after National Strawberry Month (May) comes to a close. Interesting fact: the U.S. Department of Food and Agriculture says that Americans now consume twice as many strawberries than two decades ago. If you’re looking to celebrate strawberries by creating your own scrumptious strawberry dishes, the California Strawberries web site is filled with sweet and savory recipes. 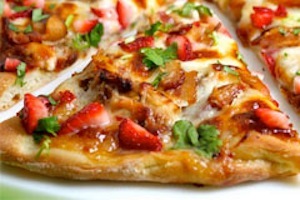 Things like Strawberry Balsamic Pizza with Chicken, Sweet Onion and Applewood Bacon or Strawberry Tostada or Roasted Strawberry Sundae. The site also has health and nutrition information, and other data. Back to the June 1 Strawberry Festival…at this event, raffle tickets will be sold for $3 each, 4 for $10, or 12 for $25. The grand prize winner gets dinner for two at 12 restaurants. In addition, 100 other raffle prizes have been donated from local businesses. If you can’t make it to the event, you can also buy tickets online or at the WAWC. WAWC has many programs and services including ones focused on literacy, early childhood education, youth development, and supporting victims of domestic violence. WAWC also offers a number of workshops throughout the year covering such topics as women’s spirituality, creative writing, body image, legal issues for battered women, financial issues, women’s history, lesbian battering, parenting issues, and women’s health issues. Saturday, June 1, 2013 11 a.m. – 4 p.m.